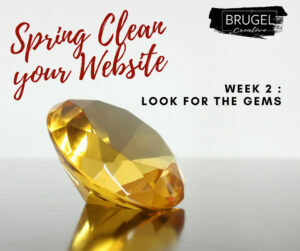 Welcome back to our Spring Clean Your Website series. We hope you’ve had a chance to see the benefits of servicing your website after last week’s tip. This week, we’re exploring some of the key features and benefits of Google Analytics. We hope our exploration will help you discover some of the hidden gems, and potentially uncover some of the dust. Google Analytics is a tool we’re certain most website owners would have heard of. To start with, let’s get to know exactly what Google Analytics is and why it’s a such a valuable resource to help grow your online brand. Google Analytics most fundamental purpose is to act as a traffic reporter for your website. Let’s all imagine the Google minions hovering in the cloud above our website on their helicopters finding out what’s going on in the street below. Google Analytics will tell you how many people are visiting your site, and where they’re from. This information is valuable as it can help you to track trends over a period of time. You can then use this information to assist your marketing and hone in on your target market. Another great feature of Google Analytics is it’s ability to let you know how someone found your website. You may be spending a whole heap of your marketing budget on things like social media campaigns and Google AdWords. These tools themselves will give you reports as to the ads performance, but if most people are finding your website through direct links, or organic search, then you need to consider how you’re spending your marketing budget. Using Google Analytics to find out the way people are finding your website can help inform your marketing spend. We’ve said it before and we’ll say it again, when it comes to SEO (Search Engine Optimisation) copy is King. Making sure you have keywords throughout your website so people who are looking for the products and/or service you offer can find you. Your Google Analytics account can highlight you what keywords people have used to find you in their google search. If you’re a web design agency, really you want people to find you when they search for a “web design agency”. But, when you check your Google Analytics account, if someone has found you because they’ve searched “Banana Peels” then perhaps you need to go through your copy and make a few adjustments. To help you with your keywords, Google has a great Keyword Planner to help you write amazing copy. It helps you find what keywords your target market are googling to find you. Once you have all of these important bits of information you will know more about the who, how and what for visitors to your website. This data can help you set and track goals to grow your business and your online traffic. If you are setting new goals remember to make them SMART. Achievable – What changes can you make to ensure you meet this goal? Are you implementing a new keyword strategy? Realistic – Consider if there may have been anything last month (perhaps a sale) that may have given you a spike in traffic that you won’t be able to match this month. Timeframe – Results seen by the end of the month. In fact, update your diary now with when you are going to check back to track your results. Where can I find all of this amazing data? It’s wonderful for us to tell you about all these great features that Google Analytics can offer, but data isn’t helpful when you don’t know where to find it. If you have a WordPress website, your web developer can install a Google Analytics plugin that will show you your Google Analytics results when you login to your website. Or, if you have your own Google Analytics account, you can login to that directly to generate all the reports you need. Don’t forget there are other stats that you can’t calculate through online analytics. People tend to get so caught up in the online world of marketing, that sadly good old-fashioned in-person marketing seems to get forgotten. You can look at the numbers, and analyse the statistics all day long, but remember at the end of the day, you want to do business with humans. Humans live in the real world and interact with more than just their devices (well, most do, anyway), so it’s important to take into account simple marketing avenues like WOM (Word-of-Mouth), business cards and brochures. If you’d like some help with your branding, we can help with that too (Be sure to check out our new Business Branding Package). If you want to find out more about how Google Analytics can help your business grow, or if you need help getting set-up, contact us. We’d love to help. Check-in next week for another Spring Cleaning tip, where we’ll help you make sure your website is working the way it’s meant to be. Do you really need a website for your new business?